With the release of our next generation Career Pages, LinkedIn is making it easy for companies to use social media to establish themselves as an employer of choice. 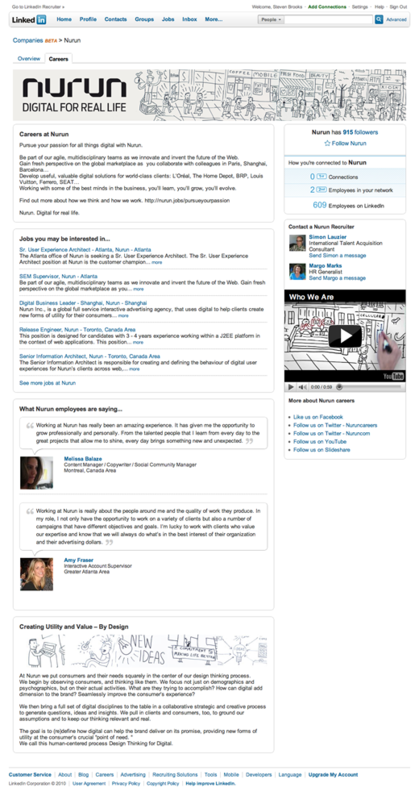 LinkedIn Career Pages are designed with flexibility in mind. You wouldn’t make the same recruiting pitch to an engineer that you would to a salesperson. So why should your careers website show these two candidates the same information? LinkedIn Career Pages can be customized to adapt to the viewer, so companies can offer one experience to a software engineer in Silicon Valley, and another to a Sales Manager in Chicago, creating a more personal connection with both candidates. Career Pages serve as a hub for the jobs you post on LinkedIn. Members learn more about companies through their career page content, and LinkedIn shows them jobs that are targeted specifically to their background. Finally, the newly added Analytics function gives companies a detailed view into what types of professionals are exploring and interacting with their page. The best candidates—especially passive candidates—do their research before investing time speaking with potential employers. Career Pages are one of the first places they turn after hearing from a recruiter or seeing a job posting on LinkedIn. We’re excited about the amazing experiences our customers are already creating for these job seekers. We’d love to know what you think. Please feel free to either leave a comment on the post or @linkedin us on Twitter.